Want to know what stops just about anyone when they open their mailbox? No, not a boxing glove. Instead, it’s a flat. No, not a flat tire. A flat-sized mailing piece. The 10 x 12 Flat. Size counts in direct mail. So it is that I opened our mailbox to be confronted by a certificate-sized 10″ x 12″ envelope. Front and center, in portrait orientation, is an open window. As I peak through I see my name, in bold, printed below a 40-point, gothic type proclamation: Proof of Eligibility. The State of Illinois is symbolically positioned above. This manifest is shielded behind a thin sheet of parchment. My reaction? Better open this now. I am not that naiive, I know this is a solicitation. But still, eligible for what? Nomination? Higher taxes? Bronzing? A beautiful label… applied on a slant, with raised shading, is actually printed, not real. 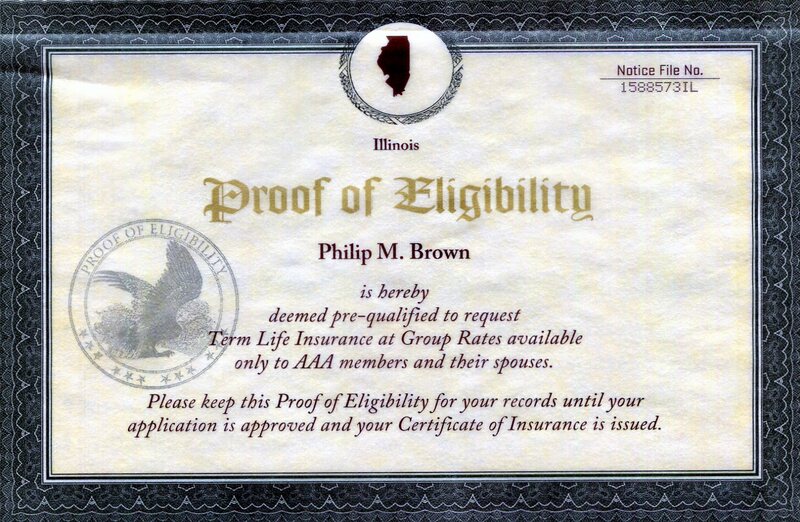 As it turns out, it is the AAA Life Insurance Company, who has decided to give me a second chance to insure my remaining days. Or until the age of 80, when all bets are off. These are the same folks who sent along a policy kit a few months back. That one was a flat too: a “fulfillment package”. Presuming I am ready to sign up, it is essentially a welcome kit. 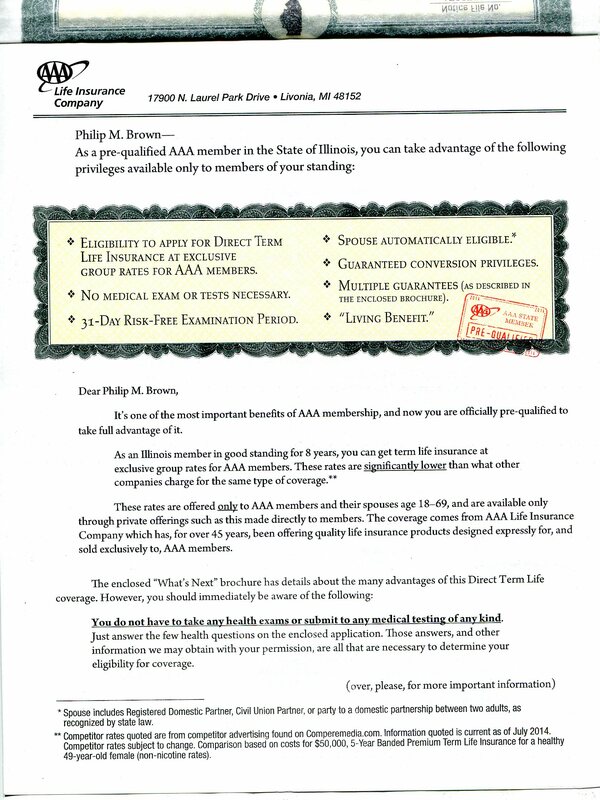 Regrettably, and unknown to AAA, I am disqualified from obtaining coverage due to a shady past. So I deferred. 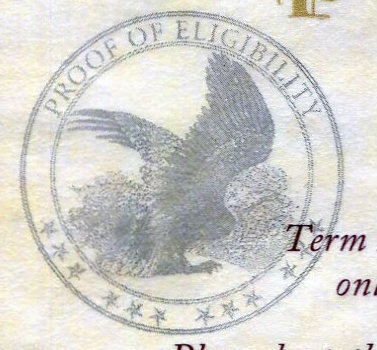 The official seal of eligibility. The reason I highlight the new kit is to point out the allure and attraction of the envelope. 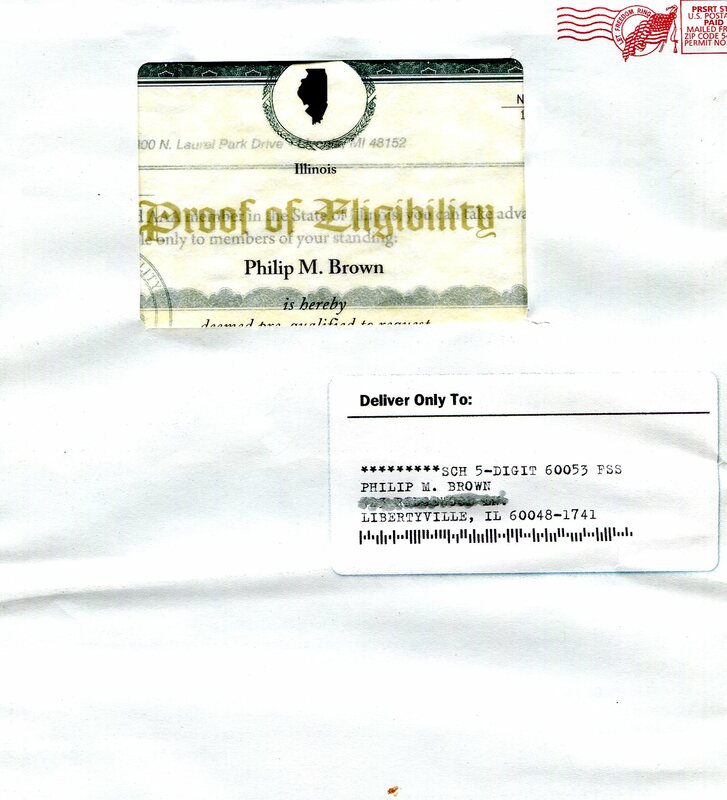 “Proof of Eligibility” is vague. But when it is presented so elegantly, it works. How many of your incoming direct mail summons use parchment? 40-point Gothic? Not much I am guessing, since the Sheriff of Nottingham died. The design strategy of this AAA kit is to get opened. My bet is that better than 90% of the recipients do open it. It is irresistible. From there, the internals have to carry the freight. 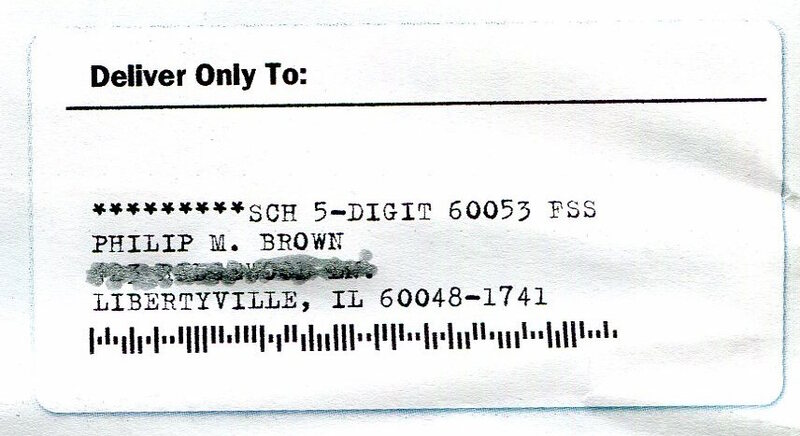 The big question you should be asking is why spend the extra postage– probably 15 cents– to send an over-sized envelope? The letter under the parchment, complete with filigree. Do the math. In a standard #10 envelope, the kit, list and assembly would cost about $250/m. Postage, another $200/m. Total, $450/m. Now lay the papers flat, and place them in a big envelope instead. Let’s say the production is cost neutral, but adding $150/m flat postage has just increased overall cost by 33%. The bottom line in direct mail: raise your production cost 33%, you must increase response 33% too. So if the small envelope garnered a 1% response, the flat needs 1.33% to stay in the game. From personal experience, I know this is achievable, and judging from AAA’s use of flats before, it’s probably not unusual for them either. By the way, what was I eligible for? Discounted premiums as an AAA member. Thanks for reading! Never pass up the opportunity to go “big” in a mailing piece. The cost may frighten you, but usually higher response will cover it.